The Rose Cafe has been an integral piece of the culinary fabric of Venice Beach since 1979. An artists hangout and gathering place for locals and tourists alike to enjoy, The Rose Cafe has been recently reinvigorated and reimagined in a way that will guarantee another 40 years or more of success. Chef Jason Neroni has kept the roots of the Rose that the community knows and loves, while introducing his seasonal, globally influenced cuisine. 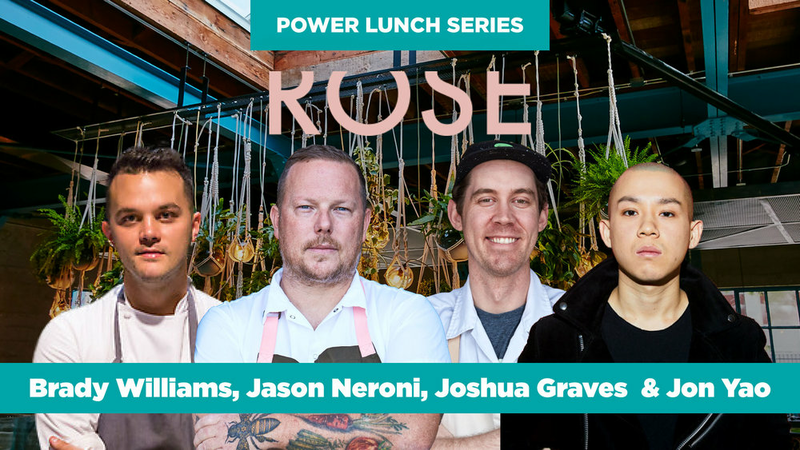 Joining Chef Jason for this fun lunch are two amazingly talented chefs: Chef Jon Yao, who owns critically acclaimed Kato in Los Angeles and who was recently named one of Food & Wine Magazines’ Best New Chefs of 2018 along with Chef Brady Williams from the storied Canlis in Seattle. Williams boasts the title of 2017 James Beard Award for Rising Star Chef and is also one of the class of 2018’s F & W Magazines Best New Chefs. Enjoy a laid-back afternoon on the patio of the Rose Cafe where you’ll be treated to good vibes, great food and a perfect playlist of tunes handpicked by Chef Jason himself.